With all of the different poker apps out there, it’s nice to find one that has a little bit of originality. The Tic A Tac iPhone app uses a unique Tic Tac Toe type of board to let you try and create as many different poker hands as you can. You can go vertical, horizontal, or diagonally in order to make the best hands. You can also decide how many discards you would like to be awarded so that you can control the difficulty of the game. Keep in mind that the less discards you have, the more points you will be awarded. As you get better at the game you can also get online and check out the online leader boards in order to see where you rank with other players. You can also post comments, make friends, upload pictures, and do much more. Not a bad poker game. Does a good job of awarding more points for less discards which makes the game that much harder. The Tic Tac Toe setup is a nice feature that sets it apart from other Poker Games and makes it worth playing. Overall, not a bad iPhone app to check out. 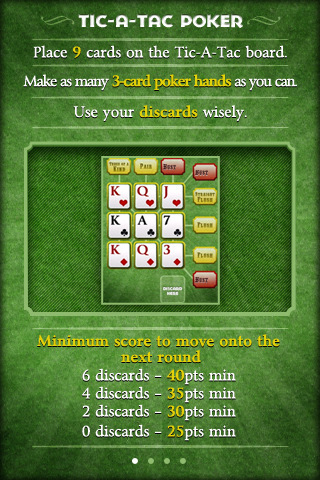 Voted 3 stars by iPhone poker app users and is currently free to download.